For centuries, the economy of Barbados was dependent upon agricultural products, chiefly sugar cane, grown on vast plantations. The owners of these plantations often built mansions, called "great houses", for their comfort and to display their wealth. 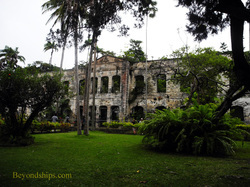 While the plantations have vanished, some of the great houses remain, in whole or in part, and are open to the public. The plantations were, of course, dependent on slave labor. Consequently, there was at one time some hostility to preserving any remains of the plantations. However, more recently, there has been a recognition that these houses are a part of the island's history. Moreover, since the great houses were often built by enslaved people, they show their artistry and craftsmanship. 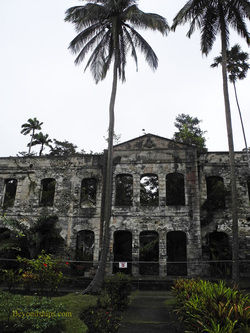 Just as the monuments of Ancient Greece and Rome - - both slave-based economies - - are preserved and admired, the great houses of the Caribbean warrant attention. 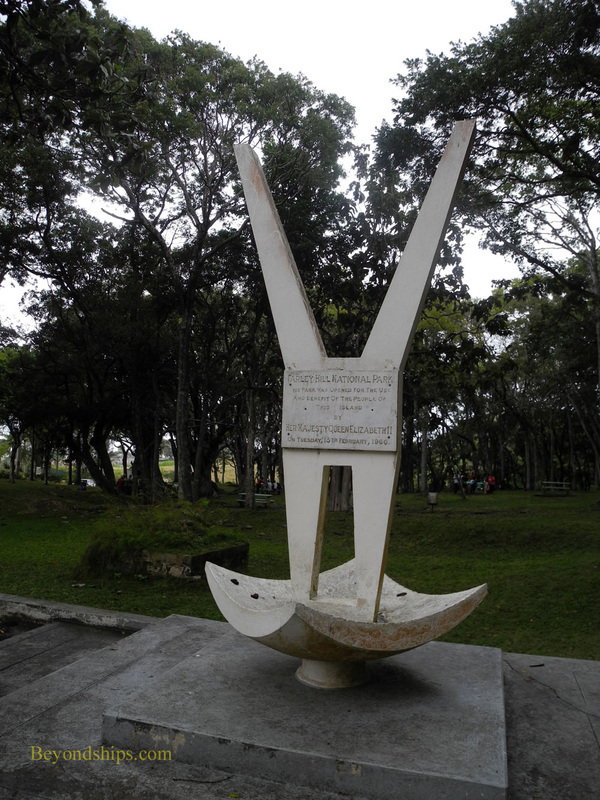 ﻿Above: A monument commemorating the opening of Farley Hill National Park by Queen Elizabeth II. 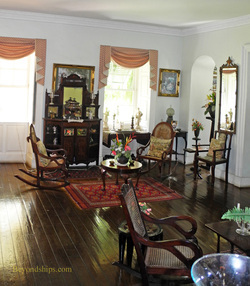 The grandest of Barbados' Great Houses was ﻿Farley Hill House﻿. Begun in 1818, it was expanded considerably in the mid-nineteenth century. During the visit to Barbados of Queen Victoria's second son, Prince Alfred, 60 people dined at Farley Hall. Later, the house hosted Victoria's grandson Prince George (later George V) on two occasions. During the 20th century, Farley Hill became too expensive to maintain and was left to deteriorate. In 1956, it was partially restored and used as a location for the movie "Islands In The Sun." However, a few years later the house caught fire and all but the outer walls were destroyed. Recognizing its historical importance the house and the grounds were purchased by the Barbados government, which cleared away the debris of the fire and restored the grounds surrounding the house. In 1966, Queen Elizabeth II opened the site as a national park. The centerpiece of the park today is the ruins of the great house. 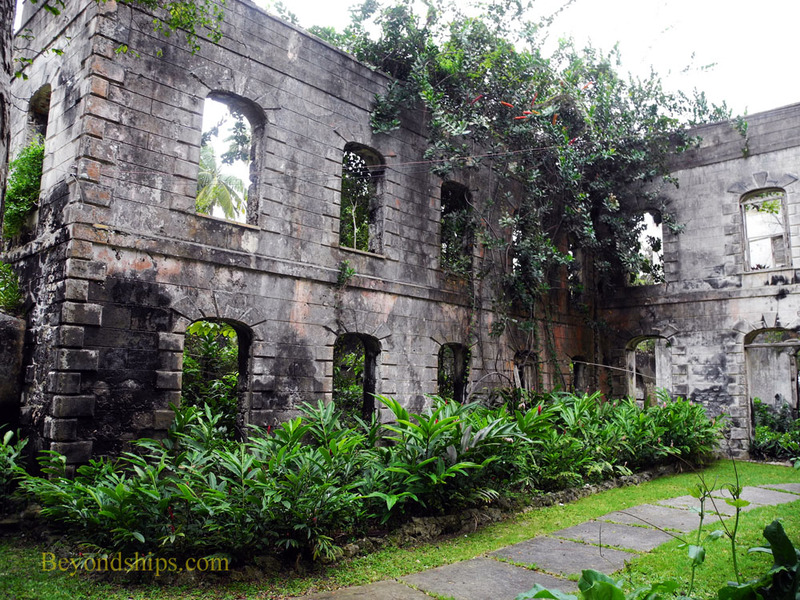 Its tall stone walls, partially overgrown with foliage and still blackened by the flames at points, give a hint of the scale and grandeur of the house's former life. A pretty formal garden has been restored in front of the house. Tall trees shade the grassy park. Farley Hill is 900 feet above sea level so it is usually cooler than the rest of the island. In addition, from the ridge that once protected the house from the winds of the Atlantic, visitors have a panoramic view of Barbados' wild northeast coast. Although not on the same scale as Farley Hill, ﻿Sunbury Plantation﻿ has been lovingly restored to its 19th century elegance. The house and the grounds immediately surrounding it are open to the public. (For an account of a visit to Sunbury Plantation, including a slideshow, click here).